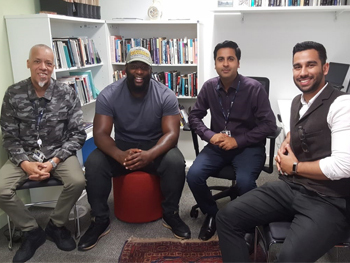 The latest PhD candidate to join Birmingham City University’s Centre for Applied Criminology is Craig Pinkney, an urban youth specialist and lecturer at University College Birmingham. Craig has over 14 years of frontline experience, and his work as an outreach worker, transformational speaker, gang exit strategist, mediator, mentor and filmmaker has enabled him to develop an international reputation. In recent times, Craig’s expertise has been requested by the Jamaica Ministry of Justice and the UK Parliament. Craig enrolled onto his PhD last month and his research focuses on violence within the context of social media and gangs in the West Midlands, England. He will be supervised by Associate Professor of Criminology – Dr Imran Awan, and Dr Mohammed Rahman. In addition, Craig will be mentored by Dr Martin Glynn, and all three academics have extensive experience researching violent offenders within real-life settings. “Birmingham is currently the gun capital of the UK, and I strongly feel that my expertise as a frontline practitioner will aid towards a novel and timely academic contribution when it comes to making sense of harmful activities. The reason why I chose BCU is because I am an alumnus of the institution and I have strong links with academics that have done exceptional work. I believe that I have the right team behind me, and they will be the ones who will shape my ideas as the PhD journey progresses”. “It is a real honour for us to have Craig at the Centre for Applied Criminology. This is a testament to the Centre and the excellent work colleagues are doing. We are at the cutting edge of debates within criminology and are delighted Craig has chosen to work with us. “It’s a big deal to be supervising Craig. We know each other from community ties and I know that his work ethic is second to none. I can relate in terms of subject area and methodology, as my own PhD focused on violent offenders within their natural settings. “The fact that my work slightly overlaps with Craig’s is beneficial, as we’ll both be able to construct ideas, concepts and thoughts that go beyond his work, and enter the realms of the Birmingham Urban Studies research cluster and mainstream criminology”. “I’ve seen Craig go from a youth worker to a lecturer. Now that he’s going to become a researcher, I’m looking forward to seeing his new growth. But the most important thing for me is that through education, Craig is contributing something in an area that society is currently struggling with." “I’m working with established academics in their respective fields. We all bring unique experiences, but what excites me the most is that I am part of a new learning journey that will be beneficial for me, the University and all those who have a vested interest in crime, harm and crime control”. Further information about Craig Pinkney can be found on his staff profile and website.